Yanhuang Art Museum is presenting the Exhibition of Founders of Modern Chinese Art Series: Liu Haisu until Sept 10, which is the second of the series after the exhibition of Xu Beihong's works. Featuring both oil paintings and traditional Chinese paintings, some 100 representative works of Liu are selected for the exhibition, including Rocks in the Middle of the Stream, Notre Dame de Paris at the Sunset, and Sunflower. Liu is known to express flickering emotions through his paintbrush, combining Western expressionism and abstractionism with Chinese traditional painting techniques. A Girl Wearing Fox Fur around Her Shoulders is an oil painting of the master's early period, focusing on the contrast between light and shadow as well as the impression of space. In the painting, the trace of Western oil masters Velazquez and Manet's style can be seen. Stalagmites and Pines in Huangshan Mountain, a milestone Chinese painting in Liu's later years, unfolds a spectacular view of Huangshan sceneries, revealing the images of streams, trees and valleys. The technique termed Color Splash (Po Cai) is adopted to better depict the sight of the majestic landscape. 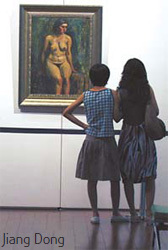 During the exhibition, there will be lectures on Liu's art, which aim to fully interpret his painting style and spirit. A video documentary in the hall will explain his art life. Born in Jiangsu in 1896, Liu is one of the most influential artists in China.